Time-Life brings us another disc of "Hee Haw" goodness with two episodes dating from 1971, during its initial run on CBS before moving to syndication after the network's famous "rural purge". 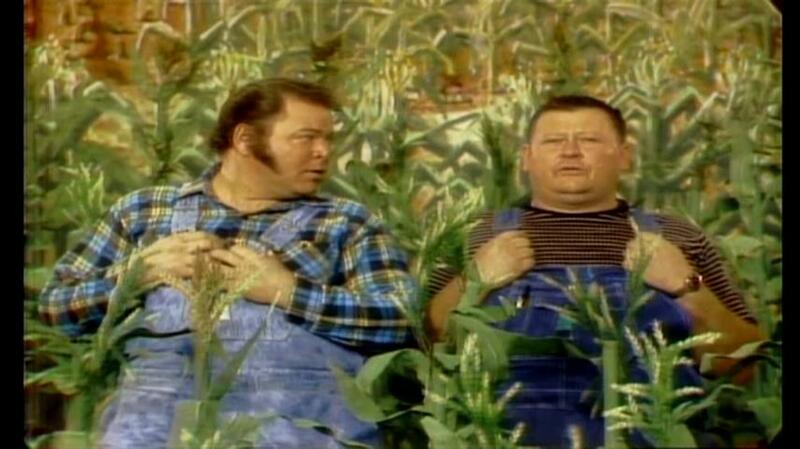 Starting in 1969 and lasting through the early 1990s, "Hee Haw" reveled in country music stereotypes with top artists performing in between comedy bits all set in the town of Kornfield, a set with farmland, old shacks and of course a cornfield. 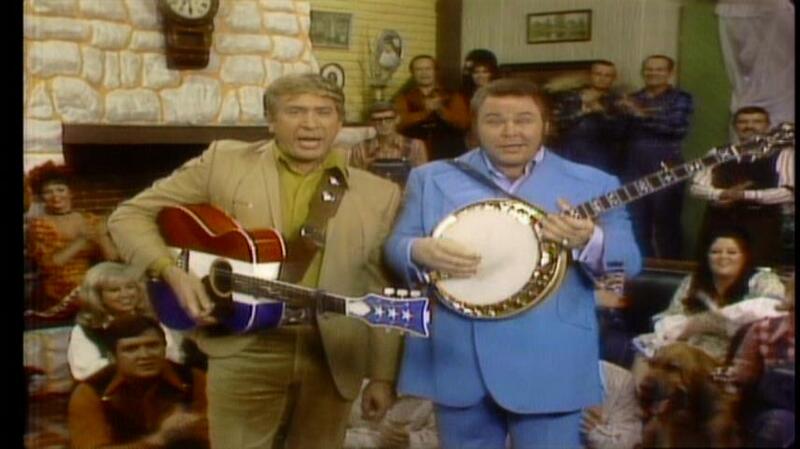 My main exposure to the show was during the early 1980s on weekend afternoons, as I was often stuck with whatever broadcast TV had to offer being that we didn't have cable or even an Atari game system, and though I wasn't a fan of country music at all "Hee Haw" was still preferable to whatever was on the other stations. The show didn't exactly strengthen my appreciation or respect for the genre, as the cast usually appeared to be gleefully stuck in the past and happily hanging around bales of hay instead of cool flashing lights or other hi-tech stuff seen in the era's rock and pop music videos (being able to watch MTV instead would have been heaven, but alas I never had access to that channel until its magic was already gone). I'd also noticed in the real world that country music fans in general were a bit behind the times, with ones I'd known not having elaborate sound systems, with country music being the last genre to still be issued on 8-track tapes in the 1980s and also the last music format to survive on inferior-sounding AM radio. Since then however I've learned that variety is a good thing and can appreciate country music in moderate doses, knowing that my synth-pop or punk records won't become unplayable afterwards. 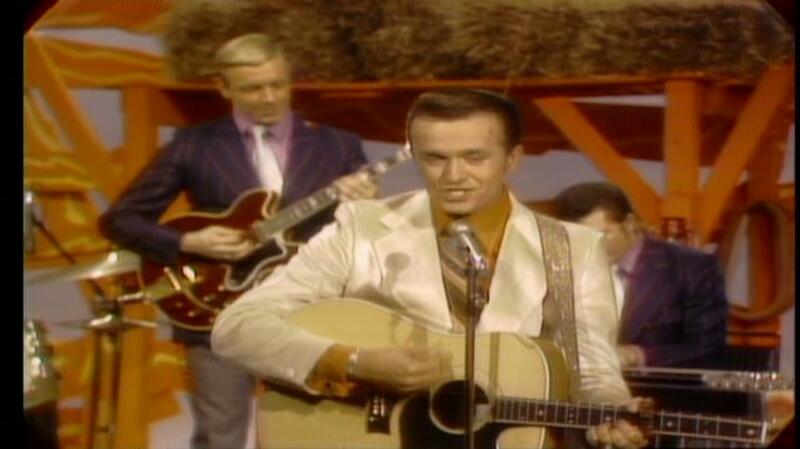 Structurally both shows presented here are the same- anchored by country legends Buck Owens and Roy Clark, along with a supporting cast and guest performers Roger Miller and Peggy Little in one episode and Loretta Lynn and Bill Anderson in the other. The format is said to have been borrowed from "Rowan and Martin's Laugh-In" (a show I haven't seen much of due to not being in reruns and its brief DVD appearance now out of print), which looking at now comes across as pretty daring compared to other television of the era, and especially considering being for an audience I had considered as not too advanced. After the intro, the videotaped show becomes quite chaotic as the cast performs its short comedy routines, filled with quick cuts and whip-pans. The humor in the routines themselves seems to be intentionally corny (pun intended), with such gems as "Did you hear the one about the nearsighted snake? It fell in love with a rope!" or a group of young women asking the elderly Minnie Pearl if it's a bad thing for a man to love you and leave you, with her replying "Not if he leaves you enough!" All of this is at such a rapid-fire pace with each routine lasting only a few seconds, so if one falls flat you hardly have time to ponder it before the next one starts up- compare that to "Saturday Night Live" for example, which I'd always thought had most of its jokes go on far too long. After watching these shows I wondered how everyone involved came up with enough of this material to fill a show every week, and it seems that most of these segments were taped within two weeks of the season's first show and used as needed after that. The shows here include a few flubs interspersed, with cast members forgetting their lines or laughing too much to continue. You can see the forerunning of the "Blue-Collar" or "Redneck" comedy that came a couple decades later, with Alvin "Junior" Samples being a likely influence for Dan Whitney's "Larry the Cable Guy." The comedy segments don't go beyond five minutes at a time- by then they figure they're about to wear out their welcome and transition into a musical performance. Most of the ones seen here appear to be at least partially lip-synched (I've found conflicting information on whether they actually were or not), and Loretta Lynn in particular appears onscreen solo with at least the backing music obviously having been pre-recorded. 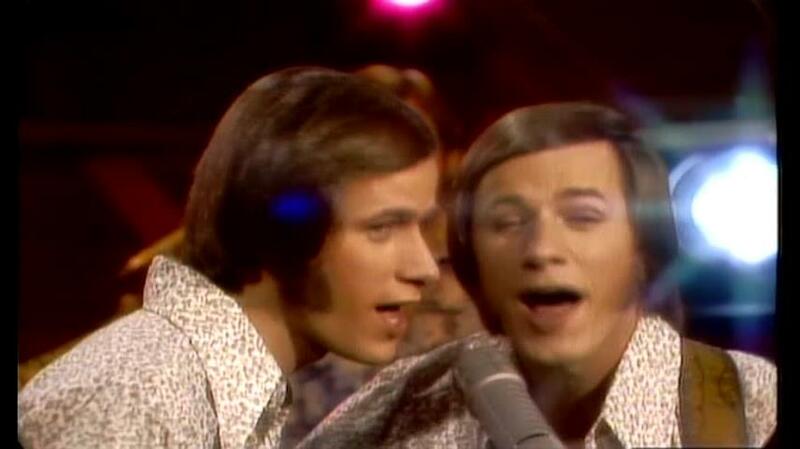 While the focus (at least in 1971) was mainly on hit country songs such as Lynn's "Coal Miner's Daughter" or Roger Miller's "Dang Me", I was surprised to see some crossover country-fied renditions of more mainstream songs: the show's resident twins Jim and Jon Hager tackle two sorta-country pop songs "Teach Your Children" and "Lookin' Out My Back Door", and Buck Owens closes both shows with a Simon and Garfunkel track: "Bridge Over Troubled Water" on the first show and "Homeward Bound" on the second. I'm usually amused by any attempts to adapt music of one genre for another and this has me curious now what other non-country songs were covered on "Hee Haw." The videotaped source material looks to be in great shape and appears almost like it could have been shot yesterday, without any noticeable dropouts or glitches. Unfortunately the disc seems to use a bit too much compression on the first episode, with background details often turning into dancing pixels- the picture also appears to be slightly squeezed, at a ratio of about 3.95x3 instead of 4x3 judging from the extra black space on the sides that doesn't seem to be inherent in the original production. The second episode looks much better in comparison with far fewer compression artifacts and no apparent squeezing. Being that sound wasn't a high priority for TV in 1971, with many network affiliates getting the audio through phone lines, the sound quality on this DVD is likely the best you will ever hear these shows. Aside from a bit of "print-thru" (where some loud sounds can be heard faintly in the background a few seconds before they show up in the foreground) the quality is reasonably good. The disc uses the usual 2-channel Dolby Digital encoding and the mono sound on the first episode stays centered as it should, but the audio on the second show sounds like it was run through a fake-stereo processor like the ones many TV stations used in the latter half of the 80s, when stereo sound was introduced to broadcast TV but a large portion of shows were still in mono. I always found this effect annoying; here it at least seems to still keep most of the sound up-front when using Pro-Logic decoding with the sound spread across the 3 front speakers. Although not indicated on the cover, both shows have been closed-captioned the old-fashioned way. Apparently the latest generation of players that lack analog outputs now have decoders for these built-in, but I must still use the analog connections on my equipment to access them. There isn't any extra material on the disc- the back cover claims "Special features include guest stars and Kornfield knee-slappers!" but these are already part of the included shows. Like Time-Life's "Carol Burnett Show" DVDs, these shows were taken from masters that had the original commercials included which were then cut out for the disc, but not so accurately as the last frame of one can be seen here- freeze-framing it shows that it was for Total cereal. Being a fan of vintage commercials from a time when they were at least kept to under ten minutes per hour, I would have liked them to have been left in. Given the overall pacing of these shows, the commercials would have served as welcome interludes here. 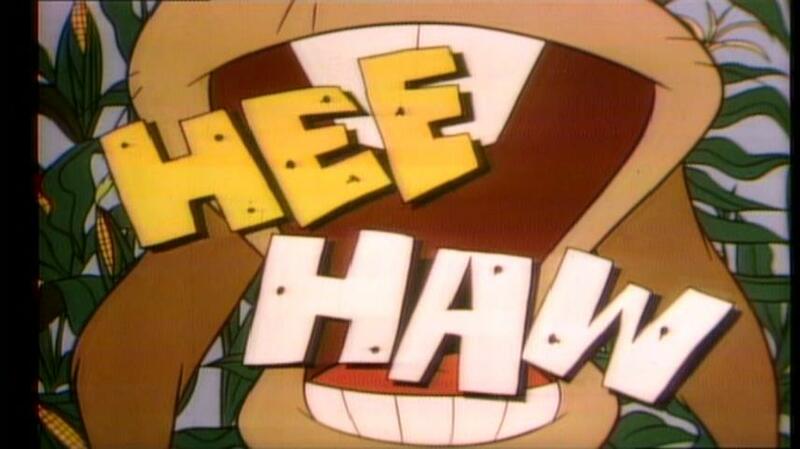 "Hee Haw" is another one of those things that you might not have thought much of when it was new, but is quite interesting to look back on nowadays. Time-Life has issued a number of "Hee Haw" DVDs so far, I'd definitely like to check out more of them although the show's format still seems to be best viewed one episode at a time- having it come on TV once a week seems like it was just the right amount.